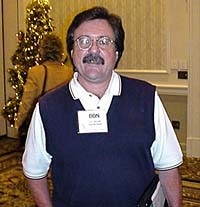 It was reported that (9) media attended FAMs hosted by Travel Michigan during the 1999 golf season. Also, articles were distributed >from Golf magazine, SCORE, Nevada Bob's, PAR Excellance, Dallas Morning News, and others, that were a direct result of previous FAMs. Travel Michigan will be purchasing (30) second spots again this year during major PGA events in the spring of 2000. These spots will be running on Saturday and Sunday, February-April in two target markets, Chicago and Toronto. In addition to the network buys, Travel Michigan has put together a partnership with the industry to feature Michigan golf courses and resorts during the same time period on Fox Sports in Chicago and Acura World of Golf on TSN (Toronto Sports Network) in Canada. A total of six (6) golf destinations participated in the program. Again this year, in partnership with the industry, Travel Michigan will be working with Golf magazine on a Michigan insert section. The section traditionally consists of eight (8) pages of editorial and advertising. Travel Michigan will be running half-page ads before and after the April issue to give Michigan golf more exposure during the key spring months before the season opens. Also in the spring (April) Travel Michigan will be placing full-page ads in the Chicago Tribune and Toronto Star's golf directory sections. Travel Michigan will be attending (4) golf shows in 2000. Chicago, Indianapolis, Toronto and Cleveland. Media related activities are planned for Chicago, Toronto and Cleveland. Again this year, Travel Michigan has reserved discounted booth space for anyone that would like to participate. Travel Michigan will be printing (550) thousand of the new Golf Michigan for 2000. This year the new publication will be published in time for the golf show season beginning in February. (50) thousand will be used for fulfillment and (500) thousand will be direct mailed throughout the Midwest and Ontario. A subcommittee of the Michigan Golf Task Force met on December 5, 1999 to work on a strategic plan for the future. For the first time according to the (NGF), Michigan was in the top ten (8th.) in destinations where golfers travel to play golf. According to their figures, almost 10% of all golf travel was to Michigan. Michigan was the only seasonal golf destination in the top 10. We can now say, "Michigan is America's Summer Golf Capital". We will be meeting to establish a new benchmark and to develop a strategic plan that will take us into the future.